Guest speakers: (from left): Sydney School of Public Health's Michelle Dickson; Professor of Indigenous Health Kathleen Clapham; Rotarian Di North, and opthalmologist and Rotarian Dr Sudarshan Sachdev. A total of 110 Rotarians, partners and friends from 22 of the Rotary Clubs around Rotary District 9675, gathered at the Fraternity Club, Fairy Meadow, on Wednesday, March 28, for a delicious two-course meal and to learn more about trachoma. The Rotarians were mainly from the nine Illawarra clubs but also from many Sydney clubs as far west as Parramatta. Trachoma is an eye infection which, if left untreated can lead to blindness from the continual irritation of eyelashes growing into the eye. Current treatments include antibiotics and surgery to turn the eyelashes outwards. Hygiene is one of the best solutions to prevent the infection in the first place. Australia is the only country in the developed world where trachoma is still a challenging health problem, mainly in our indigenous communities. The current Rotary International President, Ian Riseley, an Australian, has chosen trachoma as a major project for Australians to eliminate trachoma by 2020, a project to celebrate 100 years of Rotary in Australia. 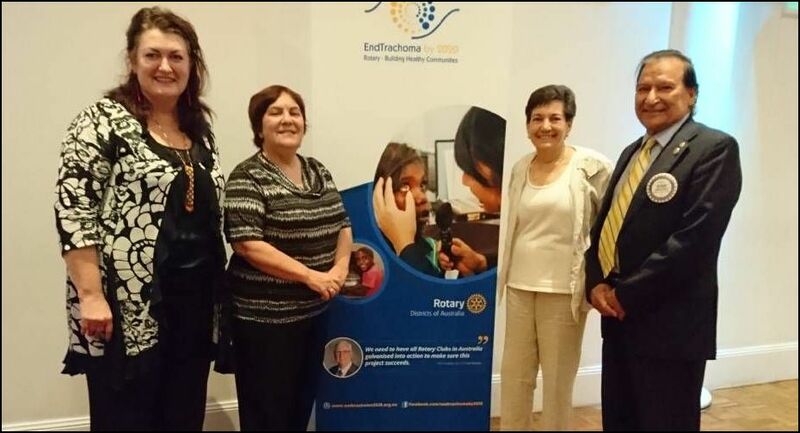 With this in mind, Di North, from the Rotary Club of West Wollongong, who is the nominee for District Governor of Rotary District 9675 in 2019-20, decided to organise an information evening for Rotarians around the district so that a plan could be formulated for this district to eliminate trachoma by 2020. The first guest speaker was Professor Kathleen Clapham from the University of Wollongong. Kathleen is a professor of indigenous health and wellbeing for the Australian Health Services Research Institute (AHSRI). Kathleen is an Aboriginal Australian so was able to give us the facts and figures on the great need to close the gap in health and education between Aboriginal Australians and the rest of the community. The second speaker was Dr Sudarshan Sachdev, an ophthalmologist from Sydney, with a special interest in trachoma. He has been to Fiji and India on surgical missions treating people with trachoma. He is a Rotarian from the Rotary Club of Rose Bay. Dr Sachdev presented slides of people suffering from trachoma showing how it is easily preventable by improving hygiene, such as washing faces and hands with soap, using clean washers, washing clothes and by using mirrors to be able to see dirty faces. Dr Sachdev explained that there is a group of Rotary Clubs in Victoria that are providing such equipment now. The third speaker, Michelle Dickson, the Director of Teaching and Learning at the Sydney School of Public Health, Sydney Medical School, the University of Sydney, spoke about what research has been undertaken in Aboriginal communities in rural Australia. Michelle is an Aboriginal Australian so is well placed to be able to conduct research on the health of these Aborigines. She explained that what works in one community will not work in another community so it is very difficult to find one solution to suit everyone. The evening finished with a group discussion facilitated by Kathy Richardson, from Kiama Rotary Club. There were many ideas put forward for a large project supported by Rotary District 9675 to help end trachoma by 2020. For more information about the trachoma project or Rotary generally, contact Dot Hennessy on 0412 120 314 or dothennessy@gmail.com.